A Real Highland Family awaits you at Homagen. 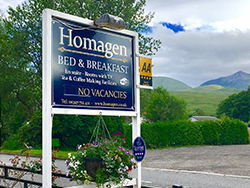 Homagen is family run Bed & Breakfast ideally situated in the Heart of the Highlands, in a rural countryside village of Roy Bridge. Suited to all visitors whether you’re touring the Highlands, Passing by, on Business or making the most of the wide range of outdoor activities for all on our door step, our location is ideal for all. 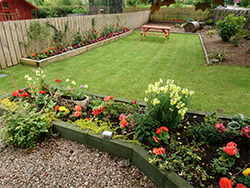 Homagen is comfortably furnished with all the facilities that you would expect. It’s like Home to Home. With views from our front door of the spectacular Grey Corries to a short drive to Nevis Range, Ben Nevis, Fort William the “OCUK” as well as the world famous Great Glen all within 12 Miles from our door step. Touring the highlands couldn’t be easier when staying at Homagen with our extensive knowledge on the local and surrounding area as well as map’s and leaflets also available to help plan your perfect visit to the Highlands and making sure you don’t miss out the wide choice of attractions, places of interest or just the perfect rest place to get a beautiful view. Looking for a room to break your journey not a problem as our comfortable rooms are ideal with early breakfast and packed lunch available on request. On Business not a problem we have FREE wireless broadband so you can always stay connected. Enter the date you wish to arrive, the number of nights you wish to stay and the number of rooms required and click “Check Availability” to confirm rates and book online.